Not all blurbs sum up a book that well, but this one tells a potential reader what she needs to know. Does he desert her, and then return to rescue her because he just can’t resist her any longer? Of course. Is she hurt and angry and suspicious of him, but so in love that she’ll forgive him? Was it really a question? Anne Stuart is known for bad boy heroes. She’s also known for snappy dialog, fast-paced plotting, steamy interludes, and pushing the envelope. The book read so quickly that I didn’t think about the general improbability of it all and just enjoyed the ride. I’d recommend it to James Bond fans. 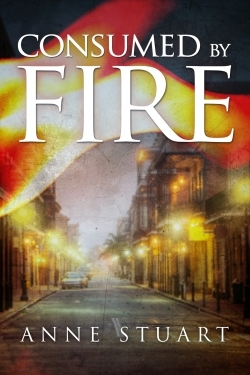 This title, the first in the new “Fire” series, continues the world of Ms. Stuart’s popular “Ice” series. It carries the Montlake Romance imprint, part of Amazon publishing. It’s available for Kindle, in audio, or in paperback. ← Throwback Thursday: Columbus Carnegie Library.